In today's news: Ohio is considering legislation that reduces penalties for CCWers that make mistakes, New Jersey State Police is suing a major gun manufacturer over apparent faulty equipment, and ISIS may be considering using gun shows as a way to obtain weapons for an attack. Meanwhile, in Oregon, they passed a law recently that makes it easier for young people to get out and hunt. And you don't want to miss the crazy story of a home invasion that ends up with an intruder shot and bleeding and the homeowner stabbed eight times! Listen in now!! Make sure you are sizing up the threat properly before taking any actions. What everyone else thinks is a threat might not be the real threat. Sports Afield. After listening to these justified stories today on the podcast, have you ever considered how you would access your gun quickly in a home invasion while still keeping your firearms stored securely? The Sports Afield line of quick access handgun safes are perfect for the task. They are foam-lined yet built with heavy-duty 16 gauge steel that will keep your firearms protected and still allow you to quickly access them in an emergency with the reliable custom-programmable 4-button key pad. A line of full-size rifle safes are also now available that makes shipping and delivery easy! Trust this 100-yr-old brand (yes, the same company that has published the Sports Afield magazine since 1887) with your firearm storage and security needs. See the full line-up at: www.concealedcarry.com/sportsafield and for a limited time save 10% with a special coupon code, but you gotta listen to the episode to get it! Guardian Nation. Looking for more training and better gear? Join Guardian Nation to be part of the fastest growing tribe of self-defense shooters nationwide. 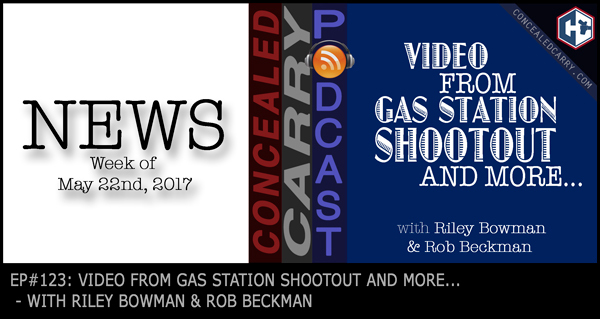 Members receive access to the ConcealedCarry.com Shooter Skill Library, Guardian Nation Live broadcasts and past recordings, as well as 10% off everything sold at concealedcarry.com. Also members receive a box of shooting gear 4 times a year which is worth at least the value of the membership. Join now and get your “dues” returned to you in gear every three months. Learn more and get started at www.guardiannation.com Also for a limited time, get our American Gun Law course at 90% off just for signing up for or being a member of Guardian Nation.